Do you know what you’re wearing during your boating trip this autumn? In the summer months you may have gone out with just a swimsuit and a pair of jean shorts, but the fall is a whole different story. You don’t know what the weather could be in Buford during the fall. As the weather begins to change from hot to cool, you’ll want to wear clothing that will keep you comfortable. Even though the weather is currently starting to cool down, you probably still aren’t too sure what to wear during your boating adventure on Lake Lanier. After all, you could enjoy wearing a sweater in the morning and then have to shed it immediately as you step out of the car and head on the water. If you’re interested in getting a boating membership to Freedom Boat Club, then contact us today, so you can enjoy boating when you want to go. 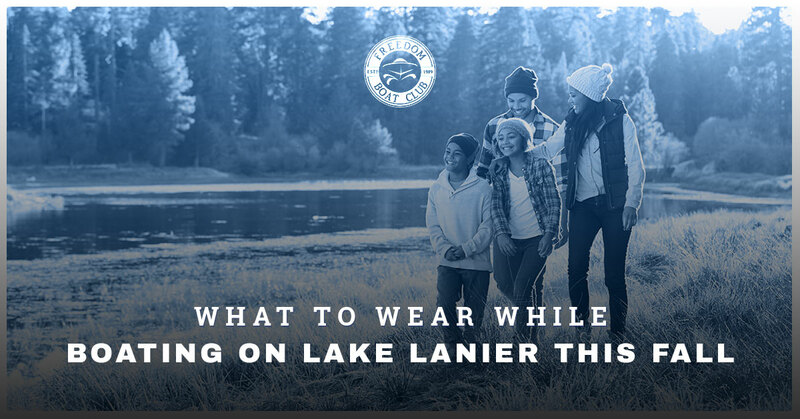 So what clothing options should be worn out onto Lake Lanier this fall? We have a few suggestions when it comes to bottoms, tops, and even swimsuits. The first thing you’ll want to do before you even head out to Freedom Boat Club is to check the weather. What’s the weather going to be while you’re out on the water? From there, you can pick and choose these suggestions to ensure that you stay comfortable during your boat ride without having to head in early because you didn’t pack correctly. Obviously, you’ll want to wear a swimsuit in the summer, but what about the fall? Should you bring a swimsuit in the autumn when you go boating? The answer is that it really depends on you, the weather, and what you and your group are going to do on the water. If you’re just going boating to enjoy some food, breathe in the outdoors, and see the beautiful foliage, then skip the bathing suit. If your friends want to get one last wakeboarding session in before cooler weather settles in, then bring the swimsuit. If the weather is going to be chilly and the water has become too cold to enjoy, then skip the swimsuit and just enjoy your time on the water. When it comes to bottoms, you can enjoy wearing bottoms that are specific for boating if you’d like or you can wear lightweight pants. While shorts or a skirt may be a little chilly for the autumn weather, lightweight pants can be a great option since they’re not too thick that you’ll be overheated, but your skin will be protected from the cooler weather. If you do get hot easily, then perhaps shorts or a skirt can be a good idea, but make sure that you bring something extra just in case you get too cold. Keep in mind if you wear a skirt, you’ll need to consider the billowing material. When it comes to tops, you’ll want to wear something that will keep you comfortable. Boating tops can be a good option because they are specifically made for being on the water. However, layers can also be the best idea because the weather will change so much throughout the day and into the night, if you’re planning to boat in the evening. A shirt should be comfortable, so you’ll want to avoid wearing darker colors or anything too tight. On the other hand, you’ll want to avoid tops with lace, loose materials, and anything that’s made from nice materials such as silk or linen because if they get wet, they can be difficult to salvage. For those who get cold easily or who would just like to bring an extra layer, we highly recommend bringing a sweater. Even if you run hot most of the time, wearing a sweater will make your experience boating a lot better because you won’t be too chilly. When the sun dips behind a cloud or begins to set, you won’t have that natural warmth, which is why a sweater can come in handy. A sweater will keep you comfortable from the cold while the sun isn’t out. Additionally, if the weather looks a bit iffy, it’ll protect you from any rain or windy weather. Lastly, the shoes you should wear while boating in the fall should be waterproof ones with grips. While wearing flip flops are incredibly easy, that doesn’t mean they’ll be beneficial when you’re on the boat. Not only do they lack grips, but the openness of them can quickly make your toes cold. Shoes that are waterproof can include anything from sneakers to water shoes. There are a variety of different shoes out there that are perfect for boating during cooler weather. For more information about what to wear while boating, read What To Wear On The Boat. We strive to provide you with the information you need to have a great time while boating on Lake Lanier. If you have any questions about what we can do for you, then reach out to Freedom Boat Club.